10:00 to 18:00 Hrs. Painting Exhibition. “6 Bulls 6”. 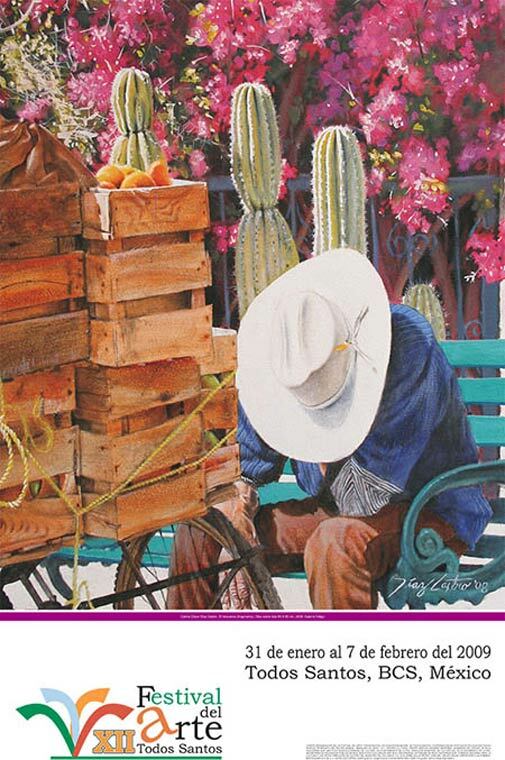 Exhibition of six Southern Baja Californian Artists. Cultural Centre “Prof. Néstor Agúndez Martínez”. 10:00 to 18:00 Hrs. Exhibition of Posters. “1968-2008, 40 years, 40 designers”. Cultural Centre “Prof. Nestor Agúndez Martínez” . 10:00 to 18:00 Hrs. Orchid Plants and Photos Exposition. “Nature’s gems” Heriberto Parra Hake. Wisdom of the Heart Foundation. “Manuel Márquez de León” Theater’s Lobby. 10:00 to 18:00 Hrs. Posters Exhibition. “The Todos Santos Arts Festival and The Latino Film Festival Posters”. “Manuel Márquez de León” Theater’s Lobby. 10:00 to 18:00 Hrs. Exhibit and Sale of Regional Crafts. Parking lot of Hotel California. Reading Encouragement Workshop. “One poem and one toy”. For 3rd and 4th grade children. 5th and 6th of February. 16:00 to 19:00 Hrs. Instructor Ernesto Adams. Introduction to Poetry Workshop. For Children. 3rd and 4th of February. 16:00 to 19:00 Hrs. Instructor Georgina Cosío. Reading Encouragement Workshop. For 5th and 4th grade children. 3rd and 4th of February. 16:00 to 19:00 Hrs. Instructor Ernesto Adams. 10:00 to 18:00 Hrs. Exhibit and Sale of Art and Regional Crafts. Public Plaza. 10:00 Hrs. Video, Lecture and Photography Exhibition. (Translated into English). “Protection of the Marine Turtle in Todos Santos”. Grupo Tortugueros Todos Santos, A.C. Public Plaza. 10:00 to 18:00 Hrs. Book Fair. Public Plaza. 13:00 Hrs. Dance. “California del Sur”. Folkloric Ballet of the Ministry of Education. Children’s Section. Public Plaza. 16:00 Hrs. Literature. Encounter of Young Poets. Cultural Centre “Prof. Néstor Agúndez Martínez”. 19:00 Hrs. Dance. “California del Sur”. Folkloric Ballet of the Ministry of Education. Juvenile Section. Public Plaza . 20:00 Hrs. Official Inauguration of the XII Todos Santos Arts Festival. Public Plaza. 20:15 Hrs. Music. Estela Núñez in Concert. Public Plaza. 10:00 Hrs.Video, Lecture and Photography Exhibition. (Translated into English). 11:00 Hrs. Dance. Group of Polynesian Dances of the University of Southern Baja California. Public Plaza. 12:30 Hrs. Music. “Sac-Be”. Group of Latin-American Music of the University of Southern Baja California. Public Plaza. 17:00 Hrs. Music. Chamber Music Concert. “Bios” group of the University of Southern Baja California. Public Plaza. 19:30 Hrs. Music. Concert of the Juvenile Orchestra of Los Cabos. 30 musicians on stage. Special appearance of the tenor Oscar Aguilar. “Manuel Márquez de León Theater”. 10:00 Hrs. Cycle of International Cinema. “Sicko”. Documentary Film. U.S.A. (2007). Directed by Michael Moore. 113 Min. Auditorium of the CECYT 02 high school, Todos Santos. 12:00 Hrs.Dance. Folkloric Ballet of the Domingo Carballo Félix Teacher’s Urban School. Public Plaza. 13:30 Hrs.Gastronomy. Gastronomic showcase of traditional Todos Santos cuisine. Public Plaza. 13:30 Hrs. Music and Dance. “Todosantenian talent” and Folkloric Ballet of the CECYT 02 high school . Public Plaza. 20:00 Hrs. Theatre. “The Labyrinth of the Self”. “Altaira” Theatre Group. “Manuel Márquez de León” Theater. 9:00 Hrs. Demonstration of Children’s Rounds and Songs. “Children’s Rounds in a Magical Town”. Kindergarden schools of Todos Santos and Pescadero. Los Pinos Park Open Theatre. 10:00 Hrs. Cycle of International Cinema. “O Brother where art thou?” Comedy. U.S.A. (2000). Directed by the Coen Brothers. 106 Min. Auditorium of the CECYT 02 high school, Todos Santos. 19:00 Hrs. Music. Mexican Barroque Music Concert. Guitars: Rubén Barranco and Guillermo Aviléz. Church of Nuestra Señora del Pilar. 20:00 Hrs. Dance. “Califerne” Live History Project. Contemporary Dance. Manuel Márquez de León Theater. 10:00 Hrs. Cycle of International Cinema. “The Well”. Suspense. Italy (2007). Directed by Gabriela Salvatore. Auditorium of the CECYT 02 high school, Todos Santos. 9:00 and 10:30 Hrs. Theatre for Children. “In Search of a Better World”. Ollin Children’s Theatre Troupe. “Manuel Márquez de León Theater”. 20:00 Hrs. Music. “Niches of Time”. Concert with Ancient pre-Columbian Musical Instruments. Antonio Zepeda. “Manuel Márquez de León” Theater. 10:00 Hrs. Cycle of International Cinema. “Baraka”. Documentary film. U.S.A. (1992). Directed by Ron Fricke. 70 Min. Auditorium of the CECYT 02 high school, Todos Santos. 19:00 Hrs. Poetry and Music. Poetical and musical ensemble. Oralia Fernández and José Angel García Borrego. “Manuel Márquez de León Theater”. 20:00 Hrs. Pantomime and Music. Comical Musical Show with Nopo the Mime. (Raúl Guadiana). “Manuel Márquez de León” Theater. 10:00 Hrs. Cycle of International Cinema. “The Amazing Vagabond Castle” Adventures. 16:00 Hrs.Literature. Encounter with the Association of Southern Baja Californian writers. Cultural Centre “Prof. Néstor Agúndez Martínez”. 20:00 Hrs. Dance. Fussion of Arab, Gipsy and Spanish Dances. Carmen Dance Workshop. “Manuel Márquez de León” Theater. 19:00 Hrs. Music and Dance. “Percusión Limanya”. African Music and Dance. Public Plaza. 20:00 Hrs. Official Closing of the XII Todos Santos Arts Festival. Public Plaza. traditional band music from Sinaloa . Public Plaza. 21:00 Hrs.Popular Dance. DIF Music Band. Public Plaza.